The wedding ceremonies of the Knānāya Christians, an endogamous community within the Syro-Malabar Church, conclude with this chant. The text, however, has no reference to wedding. There are 49 couplets in the chant. The celebrant sings the verses and the congregation repeats the first verse as a refrain at the end of each couplet. This is one of the very few Syriac chants that are sung with their original text in wedding celebrations in the Knānāya Christians even today. Mary brought forth the Son of God. May the blessing of God the Father almighty, of the Son, and of the Holy Spirit descend up on you, and abide in your hearts, now and forever. Amen. Burkhṯe d’alāha awāmse ahīdkol w’davra w’d’ruha d’qudśa nahtha alaykōn w’payśa b’lembkhōn l’ālam almīn. Amen. Source: Collected Works of Rev. Dr. Placid J. Podipara, C. M. I. (1899-1985). Vol. IV. Edited by Rev . Dr. Thomas Kalayil, C. M. I. Published by Sanjos Publications, Mannanam. 2007. Pp. 3-40. There is a hymn called “Bar Mariam” (the Son of Mary) which is sung as “paraliturgical” by priests and people at the end of the wedding ceremonies of the Southist community of the Chaldeo-Malabar rite. This community traces its origin traditionally to a foreign colony that settled down in Malabar in the 4thec. 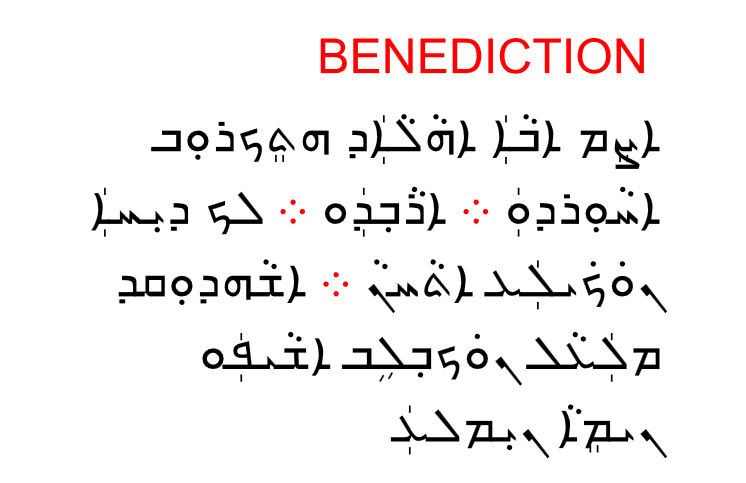 The hymn is in the Syro-Chaldean language and is translated into the Malayalam characters for the benefit of those who do not know the Syro-Chaldean characters. We give below an English translation of this hymn. The translation is from the text published in Malayalam characters by Mr. P. U. Lukas in “Ancient Songs of the Syrian Christians of Malabar (3rd edn, Kottayam, 1954, p. I. III). Mr. P. U. Lukas says (ibid. III, note) that the hymn formed a part of the Divine Office of the Chaldean rite for the feast of Christmas and Epiphany. Note: The hymn contains no philosophical or theological terms such as qnoma, parsopa. At the same time, it expresses clearly that the Son of God is the Son of Mary: in other words, Mary as the Mother of God the Son.